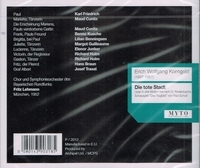 "DIE TOTE STADT (The Dead City) is an opera in three acts by Erich Wolfgang Korngold. The libretto is by a fictitious Paul Schott (actually a pseudonym for the true librettists, the composer and the composer’s father Julius Korngold), and is based on BRUGES-LA-MORTE, a short novel by Georges Rodenbach. When DIE TOTE STADT had its première on 4 December, 1920, Korngold was just 23 years old with two short one-act operas, DER RING DES POLYKRATES and VIOLANTA, already to his name. The success of these earlier works was so great that DIE TOTE STADT was subject to a fierce competition among German theaters for the right to the world première. In the end, an unusual double première was arranged and the opera opened simultaneously in Hamburg and Cologne. In Cologne the conductor was Otto Klemperer, and his wife Johanna sang Marietta. In Hamburg Korngold himself was in the theater, and the conductor was Egor Pollak. DIE TOTE STADT’s theme of overcoming the loss of a loved one resonated with contemporary audiences of the 1920s who had just come through the trauma and grief of World War I, and this undoubtedly fueled the opera’s popularity. “A child prodigy, Erich played his cantata GOLD to Gustav Mahler in 1906; Mahler called him a ‘musical genius’ and recommended study with composer Alexander von Zemlinsky. Richard Strauss also spoke very highly of the youth. At the age of 11 he composed his ballet DER SCHNEEMANN (The Snowman), which became a sensation when performed at the Vienna Court Opera in 1910, including a command performance for Emperor Franz Josef. This work was followed first with a piano trio, then his Piano Sonata # 2 in E major, which Artur Schnabel played throughout Europe.